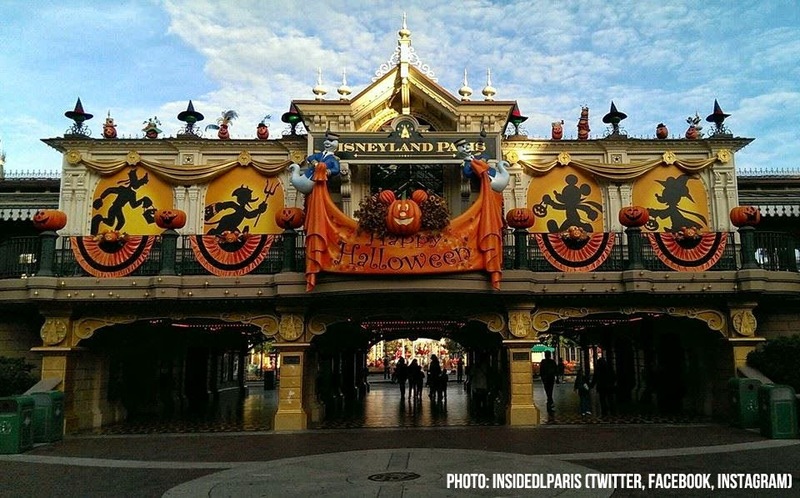 The word ‘Festival’ in the official Halloween celebration title ‘Disney’s Halloween Festival’ is not coincidental. For 2013 is the year where ‘spooktacular’ Halloween is replaced by a more humble harvest theme. 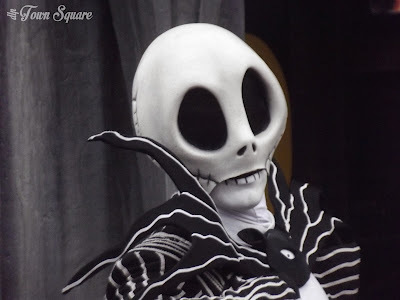 It all begins as we enter Disneyland Park and we meet the friendly Main Street USA residents who have been replaced by ghosts for one month only. sts aren’t here to terrorise us, but instead to socialise with us and welcome us to their favourite season. 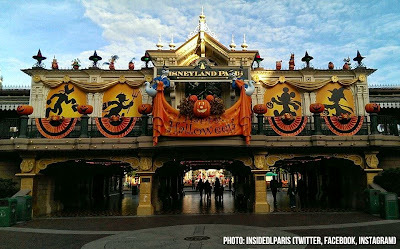 Everything about the decorations on Main Street Station reassure guests that a Disney Halloween is different. As we move through the station, we see more friendly ghosts on Main Street USA who’ve decorated their street in the Halloween colours. 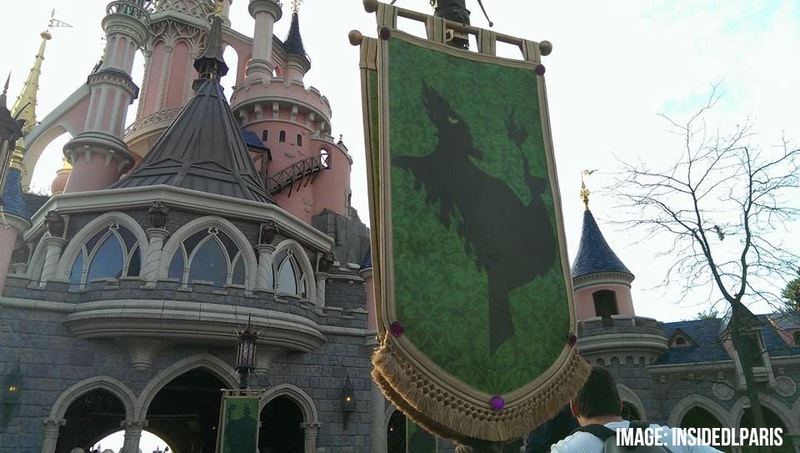 The lampposts have been turned green and a witches hat placed upon them. As we walk through Town Square we hear more of a playful cackle than the usual jolly loop we are familiar with, the sounds of Halloween fill the air, pumpkins are placed on the lush green grass and the colours of Autumn surround us. This isn’t the usual ‘ghost and ghoul’ style Halloween, this is something different. 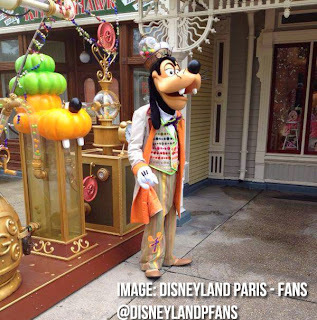 In one corner of Town Square, we see Goofy taking Halloween incredibly seriously; he is making all the candy for his friends who come and see him for a trick or treat. In another corner, Duffy is also enjoying Halloween by putting on his best Halloween outfit as he prepares to go trick or treating. 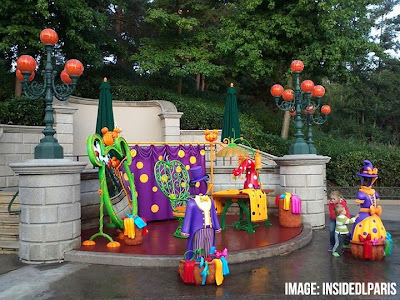 It’s not just in Town Square where friendly ghosts come out to meet their guests. As we wander further down Main Street USA we meet ghosts from all sorts of different walks of life, ever wondered who really fixed the vehicles of Main Street USA? Who really cooks your food in Walts? The residents of the town, for one month only, have arrived to meet their favourite clients, you! 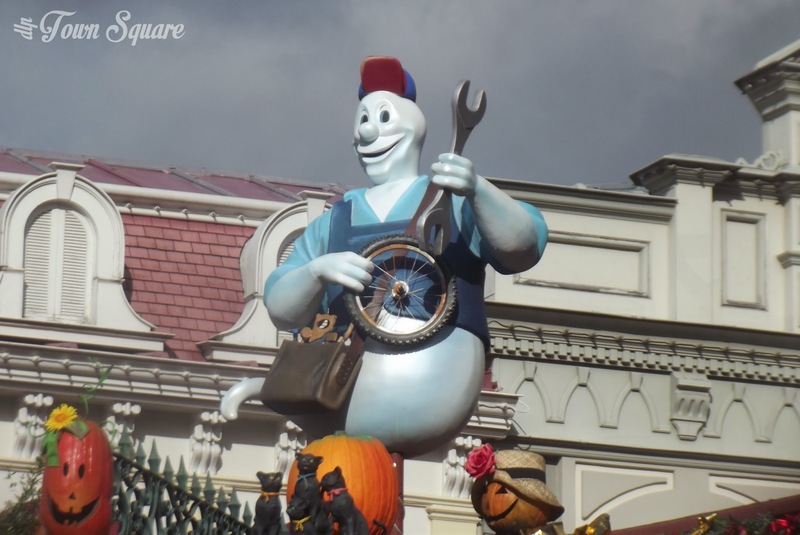 Three times a day on the parade route through Disneyland Park, the ghostly atmosphere is interrupted by Mickey and Friends who have come along to celebrate a more traditional harvest festival (To read more, check out this article by our friend at Dedicated to DLP). 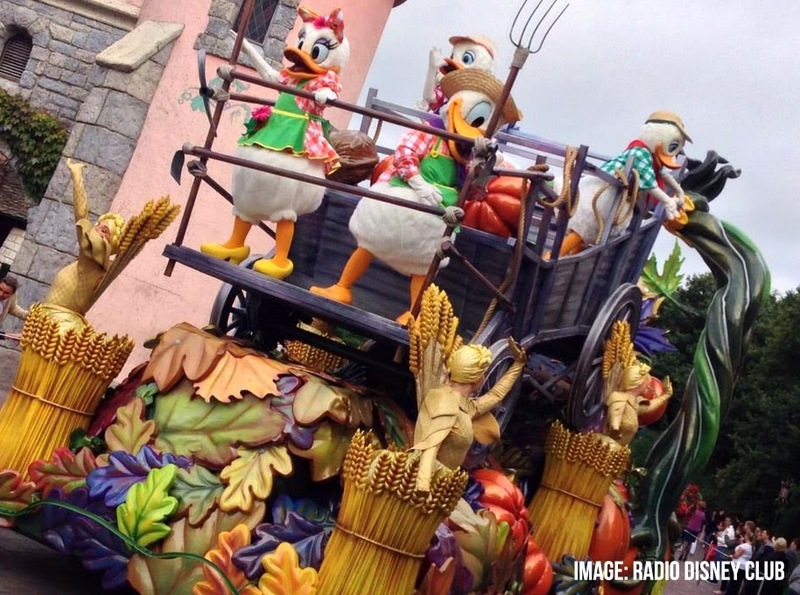 The parade soundtrack alludes to the more playful side of this harvest festival by referencing things such as ‘climbing trees’. The floats themselves bring the image of harvest through the country crop themeing along with the characters you know and love in their farmyard outfits. 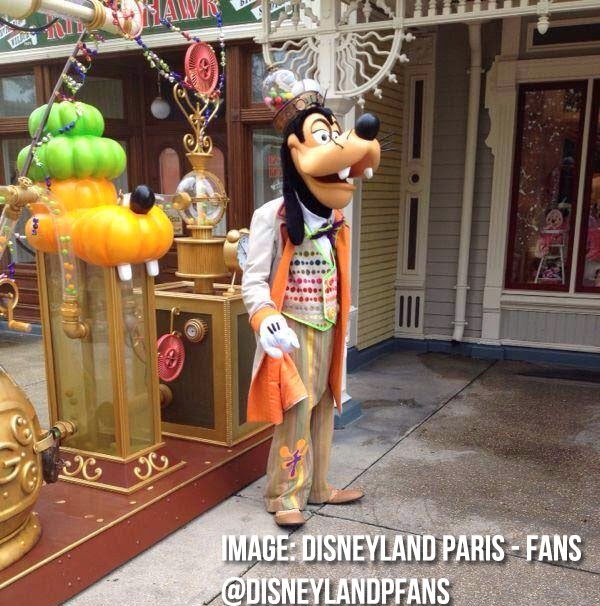 Character hunters will be pleased to see Clarabelle making her Disneyland Paris debut along with all the Ducks. What is particularly well done with this parade is the sheer number of performers involved, for a short two float parade this achieves the same satisfaction as a twenty-minute parade. The gaps before, after and in between floats are littered with dancers in beautiful costumes and with beautiful props. From the moment the parade reaches you, to the moment it has finished passing by, there are plenty of things to see and enjoy, which is its charm. This is a parade worthy of the Disney name, and will only grow in the future. We’re excited to see its evolution. As we continue walking down Main Street we hit Casey’s Corner, and Minnie’s Costume Couture where we see her outdoor fashion house. We all know that Minnie is a fashionable mouse, but we’ve never before been allowed so close to her workspace. And, if you are lucky you might even get a photo with the designer herself, who is happy to pose for photos with her friends! We move closer and closer to the Chateau de la Belle au Bois Dormant, and as we arrive in Central Plaza, we begin to notice some familiar faces in a rather unfamiliar form. We all know that Halloween has become synonymous with pumpkins. What perhaps we did not expect was that we would see Mickey and friends in pumpkin form; providing guests with a perfect photo opportunity. Frontierland is the home of Halloween spooks, with pumpkin men welcoming you to their home in Thunder Mesa, as well as the ever spooky Phantom Manor attraction which takes on a particular thrill at this time of year. But, just outside Phantom Manor why not take time to visit Jack Skellington at his spooky cemetery. As we stroll throughout the enchanting Disneyland Park, our ears are filled with the music of bands playing Disney Halloween favourites. 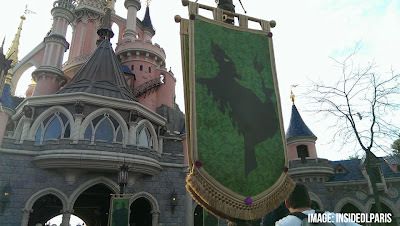 We reach our final destination of our walk through Disneyland Park this Halloween, and we receive a less than warm reception from the Disney Villains who have gathered close to the Chateau de la Belle au Bois Dormant, ready to spook us. Halloween 2013 is one of the best seasonal line ups we have seen in recent years, and just thinking that Christmas is usually taken even more seriously and that every year Halloween will get bigger sends a shiver down our spine. We look forward to finding out just what Christmas is like next month. 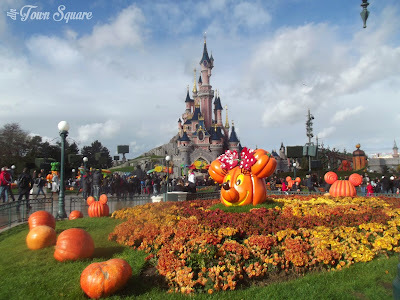 Coup de Cœur is a monthly feature on DLP Town Square celebrating what we love about Disneyland Paris and the details that make the resort so unique.